Long a pillar within Patek Philippe’s line-up, the Nautilus has always been highly sought after – thanks to its design, which has stood the test of time, and perhaps to some extent its relative scarcity. The collection receives its first high complication this year, with the arrival of the Nautilus Ref. 5740/1G-00, which comes with a perpetual calendar. Apart from the usual inclusion of a moonphase display, this perpetual-calendar timepiece also sports a 24-hour indicator, for easier adjustment of its calendar displays. This is a classic Nautilus, with a case that has a sporty, elegant look with a luxurious twist. The usual highlights are here, including the rounded octagonal bezel and integrated bracelet that present bold lines, and varied (and very well-done) surface finishes. The dial itself is predominantly blue, for a look that’s striking but still understated. Its raised horizontal embossing – yet another Nautilus hallmark – is punctuated with three subdials that house the perpetual calendar’s displays. What’s important is how the dial looks balanced whether considered on its own, or against the wider backdrop of the watch. The myriad details aren’t overpowering too, which is quite a feat in design, considering the amount of information displayed. Although Ref. 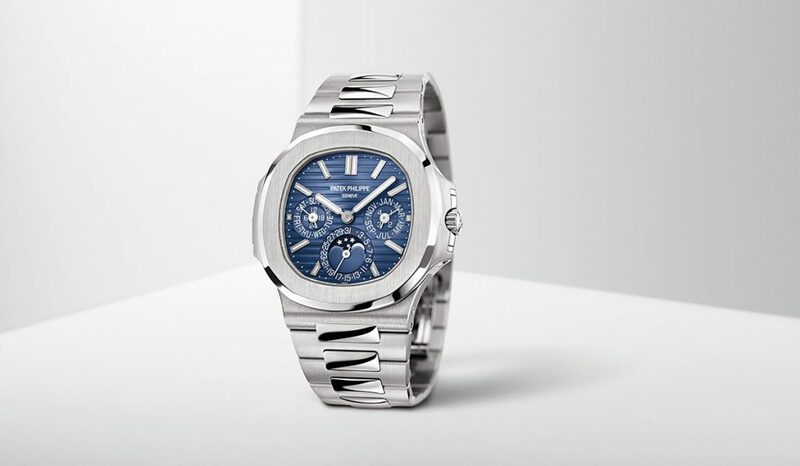 5740/1G-00 is wide at around 44mm, it’s manageable for most men, thanks to a slim profile of just 8.42mm, which was made possible by using Patek Philippe’s ultra-thin Calibre 240 Q. The integrated lugs are also relatively short and slightly curved for a better fit on most wrists. Don’t be mistaken though – the watch will make its presence felt with its white gold case and bracelet. It feels reassuringly substantial, as it should. The various correctors, which are seamlessly integrated into the Nautilus case, make adjusting this perpetual calendar simple enough.